THE governorship candidate of the Social Democratic Party (SDP) in Osun State, Senator Iyiola Omisore has taken his campaign to Ede, the hometown of his People Democratic Party (PDP) contender, Senator Ademola Adeleke. 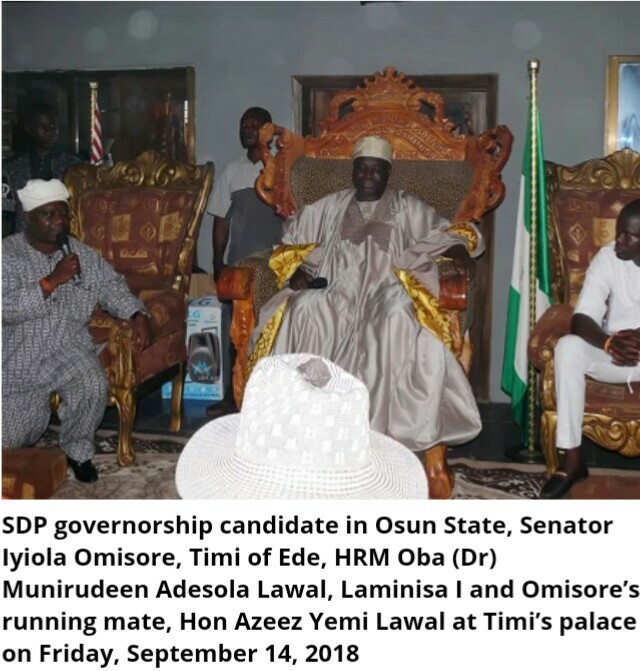 Omisore, and his campaign train, led by a national leader of the party, Dr Yemi Farounbi, earlier before addressing a mammoth crowd, who had awaited his arrival late on Friday in Ede, went in to pay homage to Timi of Ede, Oba Munirudeen Adesola Lawal, who warmly received them in his palace, in company of Baales across the town, his palace chiefs and other subjects. Oba Lawal, who said he was glad to have Omisore in his palace, said he considered him a son and not a visitor, because of the relationship he said Omisore had personally built with himself, the palace and people in his domain. The monarch recalled Omisore’s contributions to the development of Ede and his willingness to help on occasions he had the opportunity to do so, as he also lauded him on his philanthropy, saying, “God recognises good deeds, and He rewards good efforts accordingly. In his response, Omisore thanked Oba Lawal for his kind gesture, fatherly role and prayers, while he also promised to fulfil his campaign promises and live up to expectation as the state governor, saying, he had been instrumental to developments in the state and Ede most especially, as he asked the people to be prepared to vote SDP to victory in the coming election, while he promised to repair the Ede road by December 2018 if voted in as the state governor of the state. He recalled a water project he said he facilitated to the town in 1980, which he said he followed up as a senator after it was neglected for long, which he said had also suffered neglect from the outgoing All Progressive Congress (APC) government in the state, but which he said he would take care of as a governor in the state, while also promising to pay outstanding workers salaries and pensioners arrears. Earlier, Farounbi in his address at the palace, extolled Omisore’s virtues, calling him a friend of the people of Osun State, who he said was always willing to offer help, which he said was the situation when he was a deputy governor in the state and as the appropriation committee chairman in the Senate. Farounbi, a former chairman of SDP in the state in 1991, said, Omisore, being a consultant to international financial institutions which included the World Bank, International Monetary Fund (IMF), African Development Bank (AFDB) and as an engineer, he would be able to facilitate funding to develop projects in the state. Also at the Ede campaign rally, a governorship candidate of Democratic People’s Party (DPP), Prince Ayedeji Eniola Oni, withdrew his candidature for Omisore, saying he was stepping down to support Omisore, who he considered to be the best of all the 48 candidates passed by the Independent National Electoral Commission (INEC) to participate in the September 22 governorship election.